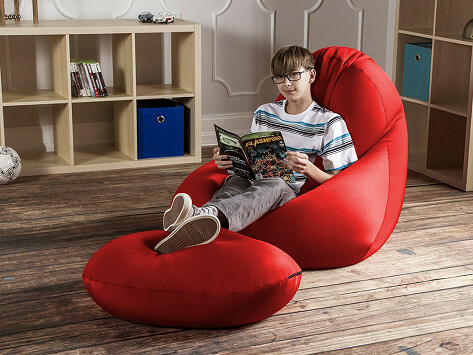 Every inch of this bean bag chair was Made in the USA. Whether you’re sitting upright and want back support or you’re using it as a floor pillow, The Nimbus’ soft, bead filling conforms to your body. And, it comes with an ottoman so your feet get that soft, comfy pampering as well. Dimensions: Chair: 48" x 33" x 12.5"; Ottoman: 18" x 18" x 10"
Weight: Chair: 8 lbs. ; Ottoman: 3 lbs. Kick back and relax on a bean bag chair that’s American made, and easy to sink into. 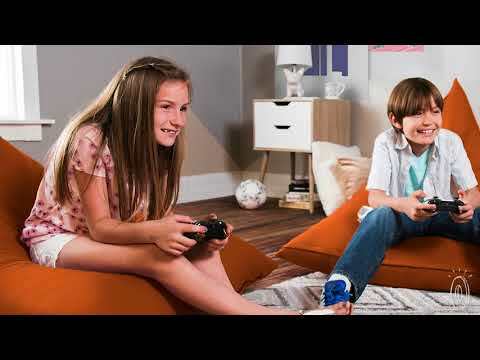 Every element of the Jaxx Bean Bag is made entirely in Atlanta, Georgia, from the soft filling down to the child-proof zippers. Lounge, read, game, or just relax on them, they’re built to dwell anywhere (living room to playroom). Different designs offer different degrees of “laid-back.” The more traditional, bead-filled beanbags conform to your body. The loungers and recliners have more back support and are perfect for gaming. With their soft, foamy design, versatility, all-American manufacturing, these beanbags are easy to cozy up to.